The ever increasing trend in U.S. education for grades to increase, and for the grade ‘A’ to become ever more common. This is one of a great many indications that education as an institution is disintegrating in contemporary America and students are actually learning less and less, while more pretense is being made that they are learning more and more. “A’s—once reserved for recognizing excellence and distinction—are today the most commonly awarded grades in America. “That’s true at both Ivy League institutions and community colleges, at huge flagship publics and tiny liberal arts schools, and in English, ethnic studies and engineering departments alike. Across the country, wherever and whatever they study, mediocre students are increasingly likely to receive supposedly superlative grades. “Such is the takeaway of a new report on grade inflation from Stuart Rojstaczer, a former Duke University professor, using data he and Furman University Professor Chris Healy collected. Analyzing 70 years of transcript records from more than 400 schools, the researchers found that the share of A grades has tripled, from just 15 percent of grades in 1940 to 45 percent in 2013. At private schools, A’s account for nearly a majority of grades awarded. “The authors attribute today’s inflation to the consumerization of higher education. That is, students pay more in tuition, and expect more in return—better service, better facilities and better grades. Or at least a leg up in employment and graduate school admissions through stronger transcripts. “And indeed, some universities have explicitly lifted their grading curves (sometimes retroactively) to make graduates more competitive in the job market, leading to a sort of grade-inflation arms race. “But rising tuition may not be the sole driver of students’ expectations for better grades, given that high school grades have also risen in recent decades. And rather than some top-down directive from administrators, grade inflation also seems related to a steady creep of pressure on professors to give higher grades in exchange for better teaching evaluations. —Catherine Rampell, “The college GPA race”, Washington Post Writers Group, reprinted in the San Francisco Chronicle, March 30, 2016. Italian Communist leader and theoretician. Raised on the impoverished island of Sardinia, a scholarship allowed him to attend Turin University where he was a brilliant student, but where he was also unfortunately strongly influenced by the liberal idealist philosopher, Benedetto Croce. In 1913 he joined the Socialist Party. In 1919 he helped found the left-wing newspaper, L’Ordine Nuovo, and was active in promoting workers’ councils (“Soviets”) in factories, which were inspired by the Bolshevik Revolution in Russia. He became more and more critical of the reformist ideas of the Socialist Party and helped to form the Communist Party of Italy in 1921. 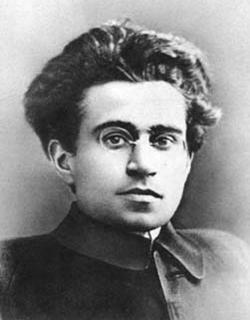 Gramsci was the Italian representative at the meeting of the Third International in Moscow in 1922, and worked for the Comintern in Moscow and Vienna in 1922-24. In 1924 he was elected to the Italian parliament and returned to Italy to became the top leader of the CPI. Mussolini was now in power, and he and his Fascist regime banned the Communist Party in 1926. Gramsci himself was arrested and spent the rest of his life in prison. Ironically, his great reputation today, especially in Left academia, derives from his time in prison where he wrote 34 notebooks, containing over 2000 printed pages. There are some difficulties in reading these notebooks both because they were just Gramsci’s own notes, with multiple notebooks being worked on simultaneously, and not something written for publication, and because of the prison authorities who prevented him from writing in a way that might be used to “inflame the masses”. This forced Gramsci to frequently write in an academic and obscure style, and to resort to Aesopian language, as when he uses the phrase “modern theory” where he simply means “Marxism”. Gramsci’s focus in his notebooks on intellectuals and their role in society, and on literature and culture, of course appeals to academics today, and explains in part his continuing popularity there. His discussion of the capitalist state is weak, certainly compared to Lenin’s firm class position on the issue. Since he was living in a prison in a Fascist country, and the Communist Party was mostly suppressed, he did not think the sort of revolutionary strategy employed by the Bolsheviks in Russia was fully appropriate there. Instead of such a frontal assault (insurrection), he thought there was the necessity of a long-term war of attrition, or a “war of position” (like the trench warfare of World War I), to prepare the way for proletarian revolution. Gramsci’s much discussed notion of hegemony seems to be related to this, the long-term struggle between the ideological hegemony of the ruling class and a hoped for alternative ideological hegemony of the working class forming around its revolutionary party. While in the advanced capitalist countries there is in fact the necessity for laying the groundwork for an eventual revolutionary uprising through patient work of organizing and education over a long period, there is also the danger that in doing so that eventual goal of revolution will become merely window dressing for reformism and revisionism. This perhaps shows why academic revisionists are so attracted to Gramsci: they see this possibility not as a danger at all, but rather more as a welcome perpetual postponement of revolution. “Pessimism of the Intellect; Optimism of the Will” —A slogan, probably authored by Gramsci himself, which appeared regularly on the masthead of L’Ordine Nuovo, the newspaper he edited. The weakest of the four known forces of nature, but the most pervasive, apparently operating at any distance, and mutually attracting all forms of matter and also all forms of energy including light. Newton’s Law of Universal Gravitation (c. 1687), is: F = Gm1m2/r2, where F is the gravitational force, G is the gravitational constant, m1 and m2 are the two masses, and r is the distance between them. Einstein’s General Theory of Relativity slightly revises Newton’s Law. “The theory of gravitational forces, whose main hypthesis is the attraction of all particles of matter for one another, yields the derived law of universal gravitation, which in turn explains, as we have seen, Kepler’s empirical laws and a wealth of other phenomena. Since one purpose of any theory is this type of explanation and summary, Newton’s theory strikes us as eminently satisfactory.” —Arnold Arons, Development of Concepts of Physics (1965). The currently intensifying great mass extinction of animals and plants which is being caused primarily by the capitalist system and rule, which values corporate profits far higher than it does the protection of nature and the environment for the continued overall benefit of humanity. Even most biologists imbued with bourgeois ideology admit that we are already in a period of a great mass extinction of species, but tend to blame this on “humanity” in general, or over-population, or governmental ignorance, etc. In other words, even the liberals among them seldom recognize the systemic causes of this extinction episode, let alone the central responsibility of the capitalist class for it. It is true that excessive human population growth is secondarily to blame for this mass extinction. But by far the most important factor is still that the ruling bourgeoisie just does not give a damn, and while they are in control of the world they refuse to take any serious steps to stop this ever-expanding annihilation of plant and animal species. It is already clear that this mass extinction will very likely be one of the greatest in the entire history of the Earth, which includes some very large die-offs many millions of years ago. Indeed, it is not entirely clear whether our own species, Homo sapiens, will survive the capitalist era. “Populations of plants, insects and birds in the U.K. have dropped precipitously in the past 40 years—more evidence that the world is in the midst of its sixth mass extinction. The previous one wiped out the dinosaurs.” —Science magazine, March 19, 2004; quoted in Scientific American, May 2004, p. 40. A severe and prolonged economic overproduction crisis which broke out in all the capitalist countries and which lasted the entire decade of the 1930s in most of them. In the U.S. the Great Depression is usually said to have begun with the stock market and financial Crash in the fall of 1929. However, the U.S. economy was already entering what we would now call a recession early in 1929, and the severe conditions we now associate with the Great Depression developed over a several year period, and didn’t reach their worst point until 1933. There was then a small upward trend for several years because of New Deal programs and de facto Keynesian deficits (though they weren’t yet called that). When President Franklin Delano Roosevelt eased off on the deficit financing, the economy again worsened in 1937-1938. As Roosevelt partially learned his lesson, and stepped up the government spending again, the Depression eased a bit after that, but didn’t come to a final end until World War II. For the U.S., therefore, the Depression—from start to finish—should be dated as lasting from 1929 through at least 1940, or about 12 years. Major depressions take a fair amount of time to develop. As mentioned in the general entry above, in the spring of 1929 there was only the beginnings of a fairly mild recession. Even after the financial Crash of 1929 (in the autumn) the immediate condition of the overall economy was still only that of mild to moderate recession. But over the next 4 years the crisis continued to develop and the overall economy continued to seriously decline. Unemployment jumped up from 3.2% in 1929 to 24.9% in 1933. And during this period more than 9,000 banks either suspended operations or completely closed down. A large part of the entire U.S. financial system had in effect collapsed. “The great severity of the banking crises in the Great Depression is well known to students of the period. The percentages of operating banks which failed in each year from 1930 to 1933 inclusive were 5.6, 10.5, 7.8, and 12.9; because of failures and mergers, the number of banks operating at the end of 1933 was only just above half the number that existed in 1929. Banks that survived experienced heavy losses.” —Ben Bernanke, Essays on the Great Depression (2000), p. 44. Similar events were occurring in all the other major capitalist countries, though—interestingly—many of them (including Britain and France) did not have major banking crises. Most bourgeois economists are quite puzzled by this fact, since they falsely believe that financial crises were the “cause” of the depression in “the real economy”. GREAT DEPRESSION OF THE 1930s — Relapse of 1937-38 in the U.S.
As mentioned in the main article above about the Great Depression, there was a weak and partial recovery in the U.S. from 1933 until 1937, and then a relapse due to the government cutting back on the budget deficits which had eased the crisis somewhat. This deficit financing was inadequate to actually bring the U.S. economy back to the level it had reached before the Depression began, and when it was cut back the economic decline once again resumed. “The recovery from the Depression is often described as slow because America did not return to full employment until after the outbreak of the second world war. But the truth is the recovery in the four years after Franklin Roosevelt took office in 1933 was incredibly rapid. Annual real GDP growth averaged over 9%. Unemployment fell from 25% to 14%. The second world war aside, the United States has never experienced such sustained, rapid growth. “However, that growth was halted by a second severe downturn in 1937-38, when unemployment surged again to 19%. The fundamental cause of this second recession was an unfortunate, and largely inadvertent, switch to contractionary fiscal and monetary policy. One source of the growth in 1936 was that Congress had overridden Mr Roosevelt’s veto and passed a large bonus for veterans of the first world war. In 1937, this fiscal stimulus disappeared. In addition, social-security taxes were collected for the first time. These factors reduced the deficit by roughly 2.5% of GDP, exerting significant contractionary pressure.” —Christina Romer, “Economic Focus: The Lessons of 1937”, The Economist, June 20, 2009, p. 82. The combination of technical methods by which the Chinese government censors the Internet. Every bourgoisie censors news and information when it feels it can get away with it and when it thinks it really needs to. The fact that the Chinese ruling class, its national bourgeoisie centered in the still so-called “Communist Party of China”, feels compelled to do this to a much greater degree than in most advanced capitalist countries in the West only shows how insecure they are. And their continuing insecurity is actually something encouraging for those who favor a new proletarian revolution in China. A term sometimes used by American economists to refer to a period of rather high inflation (by standards before and after) that occurred in the U.S. from the late 1960s to the early 1980s. There were actually two bursts of inflation during this period, with peaks in 1974 and 1980. After a long period of relatively low inflation (below 3%/year), the Consumer Price Index for urban consumers [CPI-U] picked up to 4% to 6% for most of the years in the 1968-1973 period, as the U.S. imperialists further escalated their expensive war against Vietnam. In 1974 the CPI-U jumped up to 11.0%, then eased off to the 6% to 9% range for several years. The second burst of inflation (due to govenment deficit financing attempting to deal with the first act of the long-developing new economic crisis) pushed the CPI-U to 11.3% in 1979, 13.5% in 1980, and 10.3% in 1981, before easing off again in succeeding years. The phrase “double-digit” inflation comes from this period. It took a while for the “Great Inflation” to develop, despite the many years of government deficits during the Vietnam War and the developing crisis. But when it did develop it was quite harmful to the U.S. economy. In the same way the vastly larger government deficits in the new millenium (designed to combat the new worsening stage of the economic crisis) will also come back to plague the economy. This will, before too many years, make the so-called “Great Inflation” of the 1968-1982 period seem pretty trivial by comparison! A period of very high inflation in Japan during the early 1970s, the worst year being 1974 with a consumer price rise of nearly 30%. This bout of inflation has most commonly been blamed on the big rise in oil prices with the onset of the “Mideast oil crisis” in October 1973. However, the inflation rate in Japan already reached 10% before the beginning of that crisis and was still on the way up. It therefore seems pretty clear that the primary cause of this “great inflation” was the internal economic policies of the Japanese ruling class: i.e., excessively large government deficits and excessively low interest rates, both for the purpose of keeping the capitalist economy going. A mass campaign in Maoist China launched in late 1958 and designed to swiftly raise China’s economic production and technique, especially in the countryside. While the revolutionary fervor it arose did have a substantial positive effect in some regards, this same fervor—along with inadequate overall supervision of the movement and serious sabotage by capitalist-roaders within the Communist Party—led to some major short-term problems including serious famine in some parts of the country. Local Party officials were frequently reporting bountiful harvests when in fact the harvests were poor. Overall the GLF was not a success either economically or politically, though it was also not quite the unmitigated total disaster that anti-Communist writers have often claimed. It did, however, serve to partially discredit Mao and the CCP in the eyes of the masses for a brief period. The GLF was officially ended in 1961. “[India] had, in terms of morbidity, mortality and longevity, suffered an excess in mortality over China of close to 4 [million] a year during the same period [of the Great Leap Forward]… Thus, in this one geographical area alone, more deaths resulted from ‘this failed capitalist experiment’ (more than 100 million by 1980) than can be attributed to the ‘failed communist experiment’ all over the world since 1917.” —Amartya Sen, Nobel Prize winning economist, quoted in Antony Black, ‘Black propaganda’, Guardian Weekly, Feb. 24, 2000. “In hindsight, we can usually see that if one scientist did not discover a particular law, some other person would have done so within a few months or years of the discovery. Most scientists, as Newton said, stood on the shoulders of giants to see the world just a bit farther along the horizon. In fact, I give a few examples in this book in which more than one individual discovered a law within a few years of one another, but for various reasons, including sheer luck, history sometimes remembers only the more famous discoverer. Readers may enjoy noting the frequency with which this happens in the history of science.” —Clifford Pickover, Archimedes to Hawking (2008), p. 12. The massive migration of millions of African-Americans north from the segregated and more racist Deep South of the United States, over a period of decades and in several waves. In 1910 only 10% of African-Americans lived outside the southern states, and by 1980 about 50% did. The need for labor during the First and Second World Wars opened up more job opportunities in the North and spurred two of the major waves of migration. The destruction of many jobs in the South, such as through the mechanization of agriculture, also promoted the Great Migration. A term sometimes used by American bourgeois economists to refer to the period of relatively low inflation and fairly steady (if mostly unimpressive) economic growth in the United States which lasted for a couple decades starting around the mid-1980s. In the 1970s and early 1980s there was a period of stagflation (the “Great Inflation” coupled with economic stagnation), and by that deplorable standard the economic situation in the later 1980s and 1990s was much improved. Of course “moderation” is considered a good thing by bourgeois economists when it comes to inflation, but not so good when it comes to GDP growth; so the term “The Great Moderation” seems to refer mostly to the more moderate levels of inflation during that post-stagflation period while GDP growth continued at a very modest level. Put another way, the “Great Moderation” was the erroneous theory that from 1985 on the American economy had put the period of wild swings in inflation and GDP growth permanently behind it. What was the cause of “The Great Moderation”? Why did things improve for a while? First, the government cut back on its very loose and expansive monetary policy and restrained its Keynesian budget deficits. Second, many American industries “restructured”, i.e., closed unprofitable factories and cut their workforce. Not only were huge numbers of workers layed off, but also many lower and middle-level managers were cut. All of these sorts of things were included under the name of neoliberalism, and amounted especially to a major new assault on the working class. In addition there was a much more rapid increase in consumer debt, which helped spur some renewed economic growth for a while. “The Great Moderation” included one short burst in economic growth associated with the “New Economy” bubble of the late 1990s. But that bubble then burst and there was a recession in 2000-2001. After a very slow and shallow recovery, stoked especially by the rapidly growing housing and financialization bubble, a new recession started at the end of 2007, and became a major financial crisis in the fall of 2008. This marked the complete and final end of anything that could reasonably be called “The Great Moderation”! True, for now inflation is still quite low, but the American and world capitalist economies as a whole are limping along in a very wounded fashion. This will remain the case for the coming immediate period, and will eventually collapse into a much more serious new depression. Moreover, along the way (and because of the continuing massive Keynesian deficit financing), there will eventually be a major return of inflation which will far exceed the levels of the 1970s and 1980s. A great revolutionary movement in socialist China during the Mao period which sought, initially, just to transform the cultural and ideological sphere of society, but developed into a full-scale social revolution wherein the revolutionary proletariat and its allies led by Mao overthrew the revisionists and capitalist-roaders who had seized considerable power in the government of China and within the Communist Party of China itself, and which re-established proletarian revolutionary power for a decade. The GPCR consisted of struggle, criticism and repudiation and of transformation: “The struggle to overthrow those persons in authority who are taking the capitalist road, the criticism and repudiation of the reactionary bourgeois academic ‘authorities’ and the ideology of the bourgeoisie and all other exploiting classes, and the transformation of education, literature and art, and all other parts of the superstructure that do not correspond to the socialist economic base.” [ibid., p. 9]. The highest individual target of the GPCR was Liu Shaoqi, who was appropriately labelled “China’s Khrushchev”, and was eventually dismissed from his positions and expelled from the CCP. But contrary to Western bourgeois analyses, the GPCR was not just about getting rid of a few revisionists like Liu; its goal and purpose was to change Chinese socialist society so that people like Liu could not arise and achieve high power in the Party and government in the first place. “The basic contradiction the great proletarian Cultural Revolution is trying to resolve is the one between the proletariat and the bourgeoisie, between the proletarian and bourgeois roads. The main point of the movement is to struggle against the capitalist roaders in authority in the party.” —Mao, Sept. 24, 1966, in SW9:409. “The great proletarian cultural revolution is in essence a great political revolution under the conditions of socialism made by the proletariat against the bourgeoisie and all other exploiting classes; it is a continuation of the prolonged struggle waged by the Chinese Communist Party and the masses of revolutionary people under its leadership against the Kuomintang reactionaries, a continuation of the class struggle between the proletariat and the bourgeoisie.” —Mao, a comment under the heading “Chairman Mao Tse-tung’s Latest Directive”, Peking Review, #19, May 10, 1968, p. 2. What was the role of the mass line method of leadership, or in Mao’s phrase the method of “from the masses, to the masses”, in the Great Proletarian Cultural Revolution? Mao strived very hard to make the mass line the basic method in the struggle, but unfortunately this turned out to be extremely difficult to do. Constant use of the mass line was strongly stressed from the early period of the GPCR. The article, “From the Masses, To the Masses” (People’s Daily, July 21, 1966) begins by saying: “Comrade Mao Tse-tung has said: ‘In all the practical work of our Party, all correct leadership is necessarily “from the masses, to the masses”.’ This also holds good for the work of the proletarian cultural revolution.” [Included in the pamphlet “The Great Socialist Cultural Revolution in China (6)”, online at: http://www.bannedthought.net/China/MaoEra/GPCR/GreatSocialistCulturalRevolutionInChina-06-1966.pdf] During the years leading up to the GPCR, Mao’s conception of the mass line had been seriously distorted by the capitalist roaders, and by Liu Shaoqi and Deng Xiaoping in particular. [See: The Mass Line and the American Revolutionary Movement, “Chapter 37: Chinese Revisionism and the Mass Line”, online at: http://www.massline.info/mlms/mlch37.htm] But, during the GPCR itself these earlier rightist distortions were strongly combatted, and Mao’s conception of the essence of the mass line as being “from the masses, to the masses” was clarified and reaffirmed, at least in the revolutionary media. However, the mass line method requires a leadership body to implement it. These are the cadre who gather the ideas of the masses on how to advance the struggle; who process those ideas in the light of existing MLM revolutionary theory and a careful analysis of the objective situation; and who then take these processed ideas back to the masses and use them as the focus for mass action. In limited and very local circumstances it is actually possible for a small group, or even conceivably one individual, to do all this! But it is essentially impossible for individuals or small groups to gather all the potentially useful ideas in a large region or nation; it is much less likely that an individual or small group will have the depth of understanding of both MLM theory and the overall objective situation in the whole country on which to properly process the ideas they do gather into the best political line for advancing the overall revolutionary struggle; and it will almost certainly be impossible for an individual or small group to successfully return those ideas to the broad masses in a vast country, and be able to successfully promote them as the basis for countrywide mass action. To do that, at least, you really do need a party or something very similar to one. The big difficulty in the GPCR, however, was that the Party apparatus was largely under the control and direction of the capitalist roaders. That was the very reason that the Cultural Revolution was needed in the first place! So how could the Party cadre be effectively used to lead the masses to combat the revisionism of that very cadre apparatus?! This was the conundrum. Yes, there was still Mao and his close followers at the top, if only in control of the Central Cultural Revolution Group and not the Central Committee. And there were tendrils from the CCRG down to the masses and mass organizations. But this was a tremendously weaker cadre apparatus than that of the Party cadre available for use by Mao and the Party leadership during the struggle for Liberation. What this all meant was that the Maoist method of mass leadership, the method of “from the masses, to the masses”, could—ironically—only be used somewhat erratically in the early years of the GPCR, despite Mao’s stress on it. A well functioning Party is needed to effectively use the mass line on a nationwide basis, and since the Chinese Party apparatus at that time was under the strong influence or control of the revisionists it was anything but a “well functioning Party”. This explains, to a considerable degree why the GPCR had to be rather anarchic at least in its early period. There was simply no way to avoid it. Moreover, this may also be an important part of the explanation for why the capitalist roaders could not be kept from coming back to power immediately after Mao’s death. There were a number of inherent weaknesses in the way that the GPCR had to be carried out in those existing circumstances (and not only the necessary early anarchy), and therefore necessarily also some unfortunate weaknesses in the end result. While Mao still lived, the GPCR was successful in preventing the capitalist roaders from taking over completely, and managed to both push many of their top leaders like Liu Shaoqi from power and to re-educate and revolutionize millions of Party members and ordinary people, at least to a considerable degree. For a time it appeared that the CCP was truly transformed, and that—for a long period at least—no revisionists could possibly rise to power in the Party or government. But then, immediately following Mao’s death, the staunchest anti-revisionists (including the “Gang of Four”) were purged and arrested. There ensued a short interegnum in which the stage was set for the return to power of Deng Xiaoping, the second most important capitalist roader after Liu. And then Deng did in fact lead China back to capitalism. How was it possible for this disaster to happen? What were the weaknesses and shortcomings of the GPCR which led to its ultimate failure? These are extremly important questions that every revolutionary Marxist must seriously work to answer so as to prevent any similar disaster from occurring again. “The present Great Proletarian Cultural Revolution is only the first; there will inevitably be many more in the future. The issue of who will win in the revolution can only be settled over a long historical period. If things are not properly handled, it is possible for a capitalist restoration to take place at any time in the future.” —Mao, August 1967; SW 9:418. As revolutions go, the GPCR was relatively peaceful. But there was some violence that occurred during the course of it, most of which was instigated among young Red Guards by the reactionaries in order to discredit the revolution. The 16-points guidelines laid down by Mao and the CCP Central Committee in May 1966 explicitly stated that the method to be used was that of reason and persuasion, and that coercion and violence were not to be used. “The great proletarian Cultural Revolution is a revolution that touches the souls of the people. To realize [the goals of] this revolution, [we must] resort to peaceful, not violent, struggles.” —Mao, Sept. 5, 1966, in SW9:408. “The most important plot and scheme of the very small number of persons who stubbornly persist in the bourgeois reactionary line is to incite the masses to struggle against each other. They have secretly organized and manipulated some people and mass organizations, whom they have hoodwinked, to suppress the revolution, protect themselves, and to provoke conflicts in which coercion or force are used in a vain attempt to create confusion. They spread rumors, turned black into white and shifted the blame for the evil they had done behind people’s backs on to the proletarian revolutionaries, labelling the latter with the ‘bourgeois reactionary line.’” —“Carry the Great Proletarian Cultural Revolution Through to the End”, an editorial summing up the GPCR in 1966 and laying out its goals for 1967, Peking Review, vol. 10, #1, Jan. 1, 1967, p. 10. The massive purges directed by Stalin within the Communist Party of the Soviet Union, the Soviet military and government, and Soviet society more generally, in the period leading up to World War II. Apparently hundreds of thousands of people were removed from positions of authority and influence, most of whom were then imprisoned or even shot. These purges were meant to eliminate forces within the Soviet Union who might possibly side with the invading enemy forces in what was (correctly) expected to eventually develop into an attack by German imperialism and become a major war to the death between Nazi fascism and Soviet socialism. At least in the post-World War II era, these purges have been almost universally condemned by bourgeois historians and commentators (and not just by Trotskyites), including by some people who are rather sympathetic to the Soviet Union. They condemn the purges as viciously violent, totally unnecessary, and quite counter-productive, in that they are said to have imprisoned or killed mostly innocent people and made it even more difficult to resist and defeat the Nazi attack. Based on our limited initial investigation we suspect that this criticism is correct to a considerable degree, but the matter needs to be much more thoroughly investigated—and from an MLM perspective! We hope to eventually summarize the results of such an investigation here. In the meanwhile, we urge revolutionaries to consider the possibility that there may also have been at least some secondary and partial positive aspects to this purge, even if it actually was mostly a serious error. It is quite possible, and even quite likely, that a considerable number of real enemies of the Soviet socialism were also eliminated in these purges. It has been pointed out that the Soviet Union, almost alone among the countries overrun by the Nazis, had little in the way of a “Fifth Column” [i.e., serious active support for the German invasion from people inside the USSR], and that the Soviet guerrilla resistance in the parts of the country overrun by the Germans was the strongest and most persistent of any part of Europe which the German army officially controlled. Was this just a co-incidence, or was it one actual positive result of the purges? This is one of the questions to be more fully investigated. —S.H. The most common name for the severe recession in the United States and the entire capitalist world, which is generally said to have begun in the U.S. in December 2007, and intensified in the form of a financial crisis in the fall of 2008. As the bourgeoisie measures such things, this recession lasted 18 months and ended in June 2009. However, most of the serious aspects of this recession (including extremely high real unemployment—not the phony government statistics!) continued for years, and in many respects still continue. This recession became a major episode in the most serious overproduction crisis since the Great Depression of the 1930s, but bourgeois ideologists have been unable to recognize it as part of a larger and ever-more-serious overproduction crisis let alone as the prelude to a much worse stage of that crisis which will, sooner-or-later, further develop into a new outright depression. Bourgeois economists say that the nadir of the Great Recession occurred in spring of 2009, and that production (GDP) began to expand again at that point. (The bourgeoisie generally considers recessions to be “over” if GDP begins to expand again, even if production is still far below the peak reached before the recession began. By this “logic”, if the economy declines by 4% and then later expands by just 1% the recession is “over”!) And of course the bourgeoisie gives little importance to the unemployment rate or the general economic condition of the people in determining when recessions supposedly “end”. In the summer of 2012 even the official unemployment rate (which doesn’t count a large part of those actually unemployed) was nearly double what it was when the Great Recession began. Nevertheless, in September 2010 the National Bureau of Economic Research, which American bourgeois economists grant the authority to decide such things, declared that this Great Recession ended in June 2009. Any new downturn, they said, would be counted as a totally different recession. In the U.S. the Great Recession was initially reported by the government as a decline of GDP of 3.83%. In mid-2010 the government revised these figures, stating that GDP had actually decline by 4.15% by mid 2009. This is the deepest GDP decline since the short but sharp recession in 1946 at the time the U.S. was converting from war production in World War II. [Data from “The Economist”, Aug. 7, 2010, p. 28.] 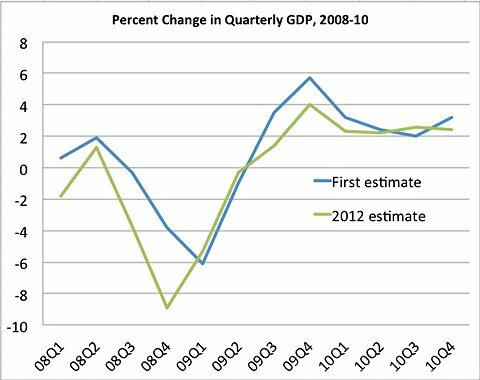 The government has further revised its estimates of the changes in GDP during the Great Recession as indicated in the graph at the right. It is now admitted that the recession was deeper than they earlier claimed, and that the so-called “recovery” has been weaker. Whatever they call it, it is certainly clear that this overall overproduction crisis has not even fully developed yet. “[In] the Great Recession some 8 million people lost their jobs; 2.5 million businesses were shuttered; and from 2007-2009, almost 4 million homes were foreclosed on each year.” —Jim Hightower, The Hightower Lowdown, Aug. 2018, p. 2. “The recovery [from the Great Recession] has also been the weakest of the post-World War II era, with annual growth averaging 2.2 percent, below the 2.8 percent pace of the previous expansion and the 3.6 percent recorded in the 1991-2001 upturn. Three out of five Americans polled by Fox News in May said the U.S. was still in recession.” —Bloomberg BusinessWeek July 5-12, 2015, p. 10. “University of California-Berkeley economics professor Emmanuel Saez determined that the top 1 percent of Americans captured 91 pecent of all income gains from 2009 to 2012, the initial years of recovery from the Great Recession. Saez based his research on pretax, pre-government-benefit income, explaining, ‘That’s the key stat to think about how the market allocates incomes in the first place. Anybody should be worried that the recovery from the Great Recession has been so skewed in terms of market incomes.’ Justin Wolfers, a senior fellow at the Peterson Institute for International Economics, did additional research on the later years of the recovery and determined that ‘so far all the gains of the recovery have gone to the top 1 percent.’ All of the gains.” —Robert W. McChesney and John Nichols, People Get Ready (2016), p. 122. As the tenth anniversary of the financial crisis associated with the Great Recession arrived in the fall of 2018, many newspapers and magazines began running articles about just how serious it all was, what a close call it was as far as possibly developing into an immediate full-scale depression, and even admitting that many of its serious problems still continue unresolved after an enire decade! Of course they still focus just on the financial crisis aspect of the Great Recession and remain completely unable to understand its basic nature as merely an episode in the long drawn-out development of a major capitalist overproduction crisis. “By the official statistics, 10 years after the fall of Lehman Brothers ‘the American economy has fuly recovered,’ said David Leonhardt. Look closely, however, ‘and you can see the lingering effects of the financial crisis everywhere.’ Citizens anxious and angry about the economy have embraced a leader who has thrown the presidency into chaos. ‘So who are you going to believe: those statistics or your own eyes?’ The trouble is that the measures that dominate the conversation mostly describe the ‘experiences of the affluent.’ Stocks, for example, are worth 60 percent more than when the financial crisis began in 2007. But most shares are owned by the wealthy, and half of Americans don’t own stocks at all. The typical household’s net worth remains about 20 percent lower than it was in 2007. Meanwhile, the most cited unemployment figure doesn’t count the millions of Americans who have given up looking for work. Indicators such as the unemployment rate and the stock market averages don’t capture ‘the realities of American life,’ and by glossing over growing inequality they’ve become increasingly misleading. We need better ones. ‘The whole point of statistics is to describe reality. When a statistic no longer does so, it’s time to find a new one.’” —David Leonhardt, “Economy’s Up, Well-Being is Not”, New York Times, as summarized in The Week, Sept. 28, 2018, p. 12. An international organization devoted to defending the world’s environment and to protests against commercial whaling and the use of nuclear power. They focus on global issues, including not only global warming, but also deforestation, pollution of the oceans, overfishing, etc. They refuse to accept contributions from corporations, governments or political parties (to lessen the possibilities of being co-opted). Greenpeace had its origins in the peace movement and anti-nuclear protests in Vancouver, Canada in the early 1970s. Greenpeace is one of the largest and most active environmental organizations in the world. Although Greenpeace is a pacifist organization, to its credit it is willing to risk openly and directly confronting corporations and nations to try to stop their ever more serious harm to the environment and their ill-considered use of nuclear power. These “direct action” activities, such as putting their own ships in the path of whaling vessels and organizing protests against nuclear-powered warships, have earned them the enmity of the capitalists and especially of the big imperialist powers. In 1985, in retaliation for Greenpeace protests against French nuclear tests on the Polynesian island of Mururoa, French military agents bombed the Greenpeace ship Rainbow Warrior while it was in the Auckland, New Zealand harbor, and killed a Greenpeace photographer. [For more information about this outrageous crime, see: “The Greenpeace Affair” in A World to Win, #4 (1985), online at: http://www.bannedthought.net/International/RIM/AWTW/1985-4/AWTW-04-Greenpeace.pdf] But this attack on Greenpeace backfired, brought the organization international attention, and led to its further considerable growth. Organizations like Greenpeace will obviously never be able to end the terrible destruction of the environment which characterizes the capitalist era; that will require the complete overthrow of capitalism worldwide. But the work of Greenpeace does serve to bring much more attention to this extremely serious damage that capitalism is doing to the world. American bourgeois economist who served as Chairman of the Federal Reserve from 1987 to 2006. Greenspan was a longtime disciple of the notorious bourgeois philosopher of self-interest and selfishness, Ayn Rand. He even authored several essays in her book, Capitalism: The Unknown Ideal, including one defending the gold standard. As Chairman of the Fed, Greenspan mostly promoted the expansion of credit bubbles, and all sorts of risky behavior by investors and ordinary people. In one speech in February 2004, he promoted the very dangerous adjustable rate mortgages (ARMs) for home buyers, that now are a major factor in many of them losing their homes. At the time of his speech interest rates were very low and were bound to rise later. In fact, just a few months after the speech Greenspan himself, as head of the Fed, began massively raising interest rates, which had the effect of hugely increasing mortgage payments for those with ARMs. The inability of many home “owners” to keep up with their adjustable rate mortgage payments is considered to be one of the major factors bringing the subprime mortgage crisis to a head in 2007-2008. “Innovation has brought about a multitude of new products, such as subprime loans and niche credit programs for immigrants. Such developments are representative of the market responses that have driven the financial services industry throughout the history of our country … With these advances in technology, lenders have taken advantage of credit-scoring models and other techniques for efficiently extending credit to a broader spectrum of consumers. … Where once more-marginal applicants would simply have been denied credit, lenders are now able to quite efficiently judge the risk posed by individual applicants and to price that risk appropriately. These improvements have led to rapid growth in subprime mortgage lending; indeed, today subprime mortgages account for roughly 10 percent of the number of all mortgages outstanding, up from just 1 or 2 percent in the early 1990s.” —Alan Greenspan, “Consumer Finance”, April 8, 2005. Federal Reserve System’s Fourth Annual Community Affairs Research Conference. Federal Reserve Board. This wondrous new subprime mortgage industry began to collapse in March 2007, and led to the more general financial crisis of the fall of 2008. Thus Greenspan is appropriately criticized for his role in the collapse of the housing bubble and for “engineering” that housing bubble to begin with. However, it is true that if Greenspan had not engineered that new bubble, the economy would simply have begun collapsing a few years sooner than it did. Under capitalism it is only bubbles that keep the economy going! Thus the basic fault here lies not with individuals like Greenspan, but with the capitalist system of production itself. Nevertheless, it is true that Greenspan promoted all sorts of highly risky financial behavior that was bound to come crashing down eventually. He never met a new type of derivative that he didn’t like. He didn’t really believe in any form of regulation, and when potential problems were pointed out he often recommended “self-regulation” (i.e., no regulation of Wall Street at all). But the financial crisis in the fall of 2008 did shake him a bit. “Bad money drives out good money.” Originally put forward when there were gold and silver coins in circulation, where the idea was that people will first spend the coins where some of the gold or silver was shaved off, and tend to hang on to the coins in better condition. This observation has been generalized to many modern “financial instruments” in capitalist society, where, for example, even if two assets have the same nominal value, people will preferentially tend to hang on to those assets which they think have the greater inherent value. An elite paramilitary commando force in Andhra Pradesh, Orissa and other states in eastern India, which was created in 1989 in order to suppress the Naxalites (Maoist revolutionaries). Over the past 5 years, through their ruthlessness and attacks on the population, they have caused a temporary setback to the revolution in the one state of Andhra Pradesh. The greyhounds are one of the highest paid police forces in all of India, even better paid than the elite National Security Guard. Much of their success in A.P. in the 2004-2009 period, however, has been due to a combination of violence toward the people and secret paid informants at the village level. The Greyhound force numbers around 2,500, and usually moves in small bands of 15-25 commandos. They are specially trained for deep forest pursuit and combat. However, they can also be defeated by the revolutionary forces. In July 2008, 35 elite Greyhound commandos on a motor launch were attacked and killed by revolutionaries in Orissa state, which was a huge setback to their operations. The amount spent during some given period (such as one year) on new fixed productive assets in the economy. However, in current bourgeois usage this is a somewhat broader category which includes not only new fixed productive assets (such as factories, machinery, mines, transportation and communication facilities, etc. ), but also schools, hospitals, offices for non-productive workers, and private residential dwellings. It should always be kept in mind that the bourgeois concept of capital differs to some degree from the Marxist concept! The total wages, profits and taxes within the economy of a country or region for a given period (often one year). In theory this is equal to the Gross Domestic Product (see entry below), but is measured independently and often the two figures differ considerably. Many of the economists who pay close attention to such things now believe that trends in GDI provide a better indication than trends in GDP for the short-term direction of the overall economy. “By the light of GDI, the American economy looks a bit more pallid. According to the income measure, activity slowed at a 7.3% annual rate in the fourth quarter of 2008. GDP, meanwhile, recorded a 5.4% drop. And in the third quarter of 2009 ... GDI continued to contract while GDP notched up the increase that led many economists to announce the end of the recession. “The picture painted by GDI throughout the downturn is one of an economy substantially weaker than indicated by GDP: one more in line with the employment data and with the experience of most Americans.” —The Economist, “Unemployment Figures: Slow Going”, March 13, 2010, p. 36. The total value (expressed in dollars or some other currency) of all the goods and services produced and sold within an economy during a given period (usually one year). The growth rate of GDP has fallen overall in all the advanced capitalist countries ever since the early 1970s. Roughly speaking, the growth rate has been less than half of what it was during the previous quarter century period (the post-World War II boom). 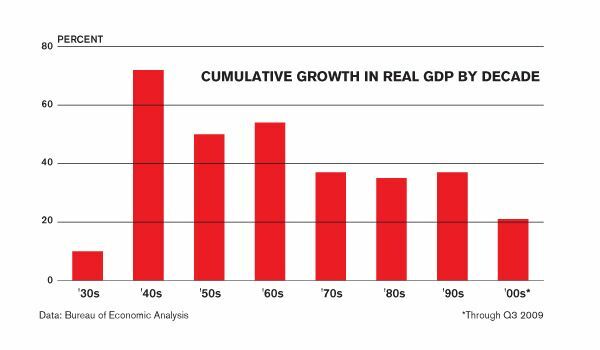 But in addition to this overall qualitative drop in the growth rate of GDP, there has also been a roughly continuous fall in GDP growth from decade to decade since the 1940s. The graph at the right shows this for the United States. This is a result of the gradually developing capitalist overproduction crisis, which is clearly getting more and more serious. There are a great many reasons why GDP, as measured by capitalist governments, is actually a wildly distorted indicator of the size of their real economies. GDP is officially the sum total of all the goods and services produced and sold in a given period. However, in practice governments include the sale of more and more things which are not actually newly produced commodities in the period in question, and may not even be actual commodities in the first place. These larger distortions occur because of the inclusion of money spent in gambling in stock markets and for other forms of fictitious capital. And there are many other distortions (exaggerations) in adding up GDP figues as well. In short GDP and GDP growth rates are all greatly exaggerated, and have become ever more exaggerated over the years. This means that the decline of GDP growth rates in recent decades (as shown in the entry above) is actually even worse than the official figures indicate! “Furthermore, the bulk of commodities is sold several times while en route from producer to consumer.” —Eugen Varga, Politico-Economic Problems of Capitalism (1968), pp. 169-170. The chart on the right, from the Economist magazine, shows the levels of GDP per person on the vertical axis along with the percentage of world population along the horizontal axis. Thus the areas for each of the named countries corresponds to their total GDP. The GDP figures are in Purchasing Power Parity terms (which is the most truthful way to compare GDP from one country to another). Note that as of 2014 China is expected to surpass the U.S. in total GDP for the first time. The World Bank Atlas (2004) defines GNI as “GDP plus net receipts of primary income (compensation of employees and property income) from abroad.” However, strictly speaking, GNI is actually Gross Domestic Income plus net receipts from abroad. So in theory GNI is equivalent to GNP, though it is measured independently and may therefore differ somewhat. Gross Domestic Product together with net property income from abroad. A generation ago GNP was used as the primary overall statistic by the U.S. government in describing its economy and those of other nations. Since the U.S. was receiving tremendous income from abroad, referring to GNP rather than GDP made the U.S. internal economy look better than it actually was. However, as other countries began to receive more and more income from the property their capitalists own in the U.S., this statistical advantage began to disappear. So the U.S. switched over to the system that other countries were using, discussing its economy in terms of GDP rather than GNP. “Maximization of GNP is not a proper objective of policy. Economists all know that, and yet their everyday use of GNP as the standard measure of economic performance apparently conveys the impression that they are evangelistic worshippers of GNP.” —William Nordhaus & James Tobin, 1972. These two liberal bourgeois economists were not suggesting that GDP be used as the standard measure of economic performance rather than GNP; they were instead proposing some broader “Measure of Economic Welfare”. This proposal has been almost completely ignored by the bourgeois economics profession, which has little concern for the welfare of the masses.